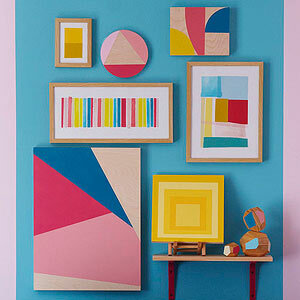 Color Blocking: create unique, personalized wall art with graphic appeal. 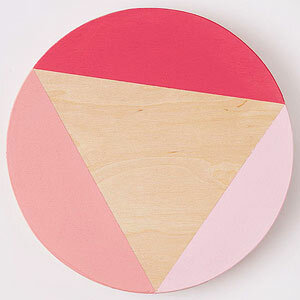 Adapt the hot fashion trend of color-blocking for your home. Use these techniques to get started. * * * Make a mixed-media collage by arranging strips of scrapbook paper and fabric on a sheet of watercolor paper. First, add color blocks using acrylic paint. Tape off the areas to paint, use water to dilute the paint to your desired shade, and use an artist's brush to paint on the color. For a free-flowing look, allow the paint to seep under the tape. 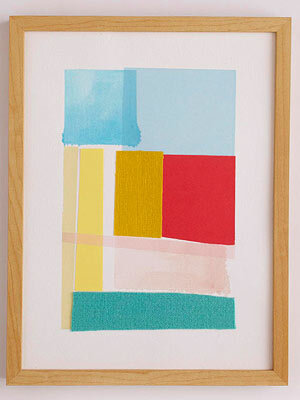 Once the paint dries, remove tape and attach the paper and fabric scraps using spray adhesive. 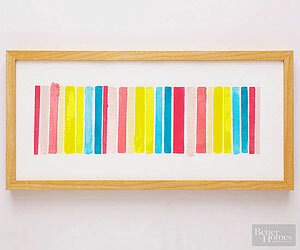 * * * Create a loose stripe color-blocked pattern with watercolor. Dip your brush in water, then in the watercolor paint. Drag the brush from the top of the stripe to the bottom of the stripe, without lifting it. Repeat with additional colors and frame when dry. * * * Use scrapbooking paper to create layers of concentric squares. Choose multiple shades of a single color. Mount the first full sheet (ours was 12x12 inches) to a piece of foam-core board using spray adhesive. 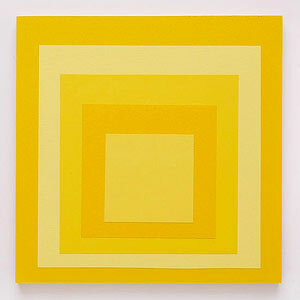 Cut each square 2 inches smaller than the previous square, then layer using spray adhesive. * * * Wood panels from an art supply store are the perfect backdrop for graphic designs. Trace or sketch lines and curves onto the wood with light pencil marks. 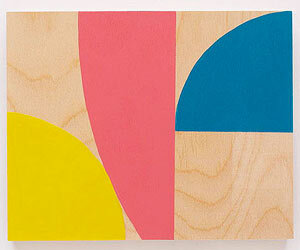 Use acrylic paint to fill in your shapes, allowing the panel to dry between colors and coats. * * * Switch up the texture of your materials, rather than the color, for another take on color-blocking. 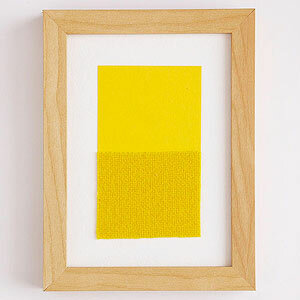 Two same-size squares in the same shade of yellow -- one smooth scrapbook paper and the other nubby upholstery fabric -- create a contrast in texture. Use spray adhesive to attach the squares to foam-core board, then frame. * * * For angular designs, use painter's tape to mask off designs, especially if the colors will run alongside each other. The tape will give you a nice, clean edge. Be sure to let the paint fully dry and cure before you tape over it and paint the next color. 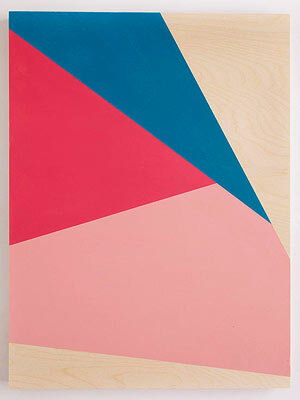 * * * Combine two trends in one by pairing color-blocking with an ombre effect. Start with a base color for one block, then dilute it with white paint to get a lighter shade for the next block. Dilute it with another round of white paint to get an even lighter shade. Or, buy premixed gradients.